The Geneva Rotary Club is proud to honor Jim DeVaney with this year’s Springstead Award in commemoration of his exemplary community service to Geneva. Club President Tara Rago announced that DeVaney will receive the distinguished honor at the Geneva Rotary Service Above Self Dinner on Thursday, April 26, at Club 86. A long-time Geneva businessman, his family business, the DeVaney-Bennett Funeral Home, has been a fixture in Geneva for four generations. 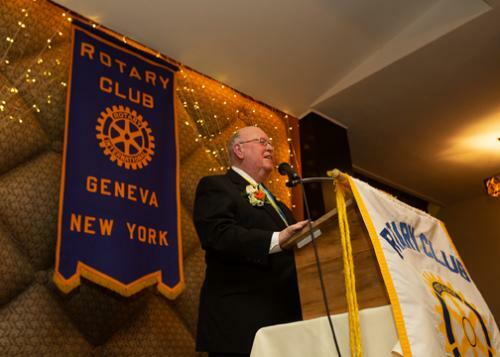 The Geneva Rotary Club established the Springstead Award seven years ago. The award is named for the late Ralph Springstead, who was a long-time Geneva banker and a member of Geneva Rotary. Springstead supported community service in a quiet and sometimes anonymous way. Past recipients of the award are the late Carl Fribolin, the Rev. James Gerling, the late Rosa Blue, David and Brenda Rickey, Mark and Mary Gearan, Judge Walter Gage and Nozomi Williams. The Service Above Self gala is a celebration of community service in Geneva and features the presentation of the Springstead Award and Rotary Paul Harris Fellow honors as well as a dinner, other awards and a silent auction. The Co-Chairs of this year’s event are Lisa Ventura and Richard Austin. 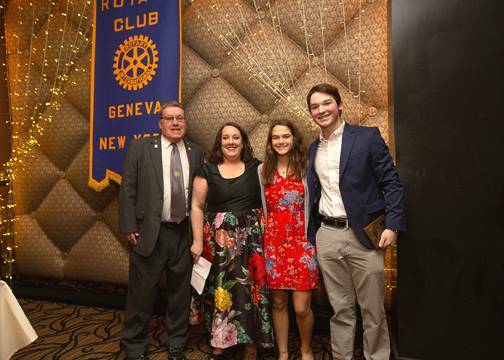 The 2017 event raised $25,000 that the local Rotary club contributed to Geneva projects and programs, including $11,000 to the Geneva City School District Backpack Program for food for needy children on weekends. 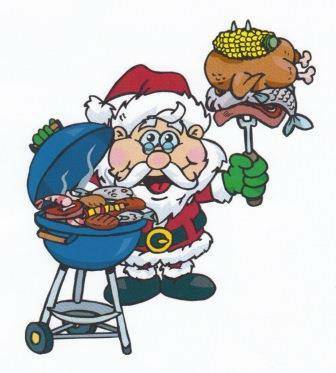 For a reservation for the dinner, contact Karen Luttrell at 315-828-3078 or e-mail dinner@genevarotaryclub.org. The ticket price is $50. Tickets also can be purchased online at eventbrite.com. Corporate and Business sponsorships are also available and interested persons should contact Austin at 585-739-8662. Information on the dinner also is available on the Geneva Rotary Club Facebook page and the club website at genevarotaryclub.org. Active in the community for many years, DeVaney epitomizes the phrase “donating time, talent and treasure.” He is President of the Ancient Order of Hibernians and a former president of the Geneva Rotary Club, the Nester Hose Company of the Geneva Fire Department and the Geneva Kiwanis Club. His community activities run the gamut from business to service. DeVaney is a former President of the Geneva Area Chamber of Commerce and a former member of Geneva Growth. A business leader in the community, he has been involved in numerous activities designed to improve Geneva’s business climate. 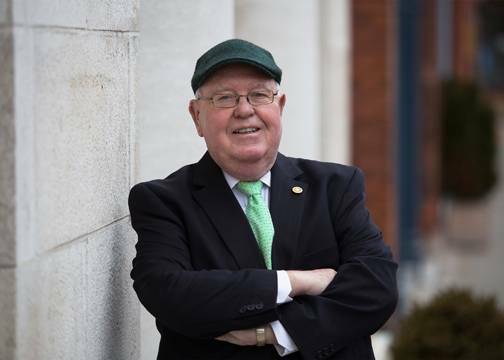 His Catholic and Irish heritage have played a key role in his community activities. A proud supporter of DeSales High School, where he graduated in the Class of 1964, he supported DeSales through thick and thin. 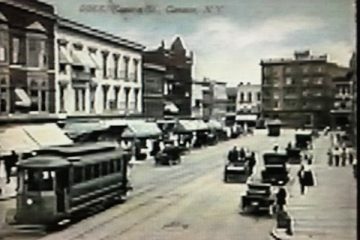 His involvement in education continues today in his service on the Board of Trustees of Finger Lakes Community College. Devotedly proud of his Catholic heritage, he has been a leader in the Knights of Columbus, the world’s largest Catholic fraternal service organization. He served as Faithful Navigator and Grand Knight of the organization and remains an active member today. He was very involved in starting a chapter of the Ancient Order of Hibernians in Geneva. Continuing in the Irish tradition, his love of Notre Dame University and its football team is legendary, both here and in the home of Notre Dame in South Bend, IN. His history has been one of becoming involved, and then becoming a leader. Countless folks through the years have recognized the qualities embodied in the Springstead Award. Another Service Above Self highlight will be the presentation of two Paul Harris Fellow awards. Recipients of the award do not have to be Rotarians. President Rago explained that the local Rotary club wants this event to commemorate community service by all organizations and people in the community, not just Rotarians. Rotary also has two youth organizations, Interact at Geneva High School and Rotaract at Hobart and William Smith Colleges. Awards will be presented to the Interactor of the Year and the Rotaractor of the Year. Rotary International is composed of 1.2 million men and women around the world who donate their expertise, time and funds to support local and international projects that help people in need and promote understanding amongst cultures. If you are interested in serving your community in a new way and are interested in becoming a Geneva Rotarian, please contact secretary@genevarotaryclub.org for more information or visit us on our website at www.genevarotaryclub.org. Geneva Rotary meets every Wednesday at noon at the Geneva Country Club. See photos from the Service Above Self Gala.